radiation (EMR’s) emitted from smart meters. Smartblock is a locally designed product that is proven to protect you and your family from the high levels of EMR’s. Using Faraday Cage technology Smartblocks fit over the smart meter whilst still communicating with the grid. Smart Meters throw 3x times the safe levels! Protect yourself from Smart Meters. Smart Meters throw out high levels of EMR and EMF’s which can affect health. 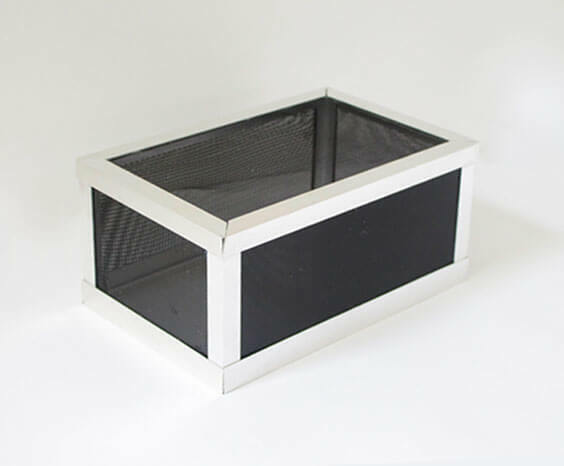 Smartblock is made from 24 separate pieces of individually cut pure Australian aluminium alloy and five separate screens of marine strength, powder coated aluminium mesh. A Faraday cage is named after its inventor, the English scientist Michael Faraday. In 1836, he observed that an excess charge on any hollow conductor remained on its surface and did not affect anything placed within it…. The Smartblock is so easy to install. Its a 3 step process that takes minutes but protects you and your family for a lifetime. Are you suffering the symptoms of electrohypersensitivity? There are many health complaints that have been connected to radiation sickness. My sleep has improved enormously in the two weeks I have had Smartblock. This has restored my sanity. I feel more at ease in my home knowing that my family are being protected from the EM radiation that comes from our smart meter. I never realised just how much EMR was being emitted from our smart meter. Smartblock reduced it by over 98%. Thanks Smartblock! Smartblock is an Australian family business that manufactures electronic blocking devices for the Australian and International market. Our products are made from quality local sources and are designed to provide a safe environment for your family.